StatSoft, Inc., announces that the medical and financial value of its STATISTICA predictive analytics solution was recently confirmed yet again in a cost-savings study conducted by doctoral residents affiliated with St. John Health System. The study, “Detection of Stress Induced Ischemia in Patients with Chest Pain After ‘Rule-out ACS’ Protocol,” was conducted by third-year resident Sergii Alekseiev, MD, and Chief Resident Ambria Harris, DO, under the auspices of Gary Miner, PhD, and Linda Miner, PhD. The aim of their study was to identify the impact of improved diagnostic accuracy achieved through STATISTICA’s predictive analytics solutions. To accomplish this, Alekseiev and Harris assessed the current practice of stress imaging in emergency room patients admitted with chest pain after “rule-out ACS” protocol. This was done by developing an advanced predictive model using STATISTICA Data Miner that accurately predicts the outcome of further testing to determine the likelihood that such patients are at risk for cardiac events. Conventional practice requires further expensive testing and hospitalization while patients wait for test results. But, according to Alekseiev and Harris’ conclusions, the results of the STATISTICA model suggest “that a substantial subset of patients with chest pain and negative ACS workup can be safely discharged without performing MPS and subsequent outpatient follow-up,” thus improving patient care and substantially reducing medical costs. 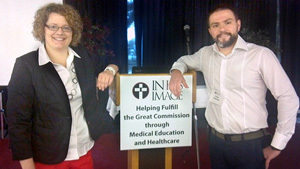 Alekseiev and Harris presented their research findings to an international audience at the annual Scientific Assembly and Graduation of the In His Image (IHI) Family Medicine Residency program of Tulsa, held in June 2013 at Sequoia Lodge in Oklahoma. Their study will be extended by the current group of second-year IHI residents, who will also pursue development of a smart phone app that emergency room doctors can use to submit predictor variables to the STATISTICA model. Full results of this study will be included as a guest tutorial in the upcoming book, Practical Predictive Analytics and Decisioning Systems for Medicine: Informatics Accuracy and Cost-Effectiveness for Healthcare Administration and Delivery Including Medical Research, by Dr. Linda Miner, et al (Elsevier, 2014). StatSoft was founded in 1984 and is now one of the world’s largest providers of analytics software, with 30 offices around the globe and more than one million users of its STATISTICA software. StatSoft’s solutions enjoy an extremely high level of user satisfaction across industries, as demonstrated in the unprecedented record of top ratings in practically all published reviews and large, independent surveys of analytics users worldwide. With its comprehensive suite of STATISTICA solutions for a wide variety of industries, StatSoft is a trusted partner of the world’s largest organizations and businesses (including most of the Fortune 500 companies), providing mission-critical applications that help them increase productivity, control risk, reduce waste, streamline operations, achieve regulatory compliance, and protect the environment. StatSoft, Inc. was founded in 1984 and is now one of the largest global providers of analytic software worldwide. StatSoft is also the largest manufacturer of enterprise-wide quality control and improvement software systems in the world, and the only company capable of supporting its QC products worldwide, with wholly owned subsidiaries in all major markets (StatSoft has 23 full-service offices, on all continents), and its software is available in more than 10 languages. Posted on October 17, 2013, in Uncategorized. Bookmark the permalink. Leave a comment.